Digital transformation is happening! It’s driving companies to adopt new ways to capture and analyze data (the new oil), to discover new insights and optimize the way they run their businesses. IT is evolving to meet these new requirements, becoming more agile to keep up with dynamic markets - and the competition. The Cloud is a key, but on-prem infrastructures are, and will be, a part of most enterprise’s future. Join Eric Slack, Sr Analyst with the Evaluator Group and see how CI, HCI and Composable can address this need for agile, comprehensive infrastructures that reduce time for design, configuration, deployment and operations. Even with a cloud-first strategy, enterprise IT is increasingly concluding that there will always be an on-premises component, leading them to the conclusion that the hybrid cloud is the only long-term end state. This presentation focuses on the data aspect of hybrid cloud. Storage is foundational to computing. The same statement is just as true for hybrid cloud computing. This presentation looks briefly at the data aspect by identifying use cases (DR, data protection, archive, etc.) and then looks into how users are implementing and managing hybrid cloud storage. Converged and Hyperconverged technologies have been out for a number of years. And now Composable is here, and being touted as the next big thing in the Integrated Infrastructure space. All of these technologies are evolving, including Hyperconverged being sold as SDS. How do you know what fits or is right for your environment? Should you be considering these as a replacement for your current systems or for new apps? What are the top use cases in AI? Or should we say, what will be the top use cases in the next 5-10 years? How are companies using the disciplines of Machine Learning, Deep Learning and HPC? What is needed to enable faster adoption? What technology changes are expected or required? Evaluator Group and Tractica, leading analyst firms on the topic of Artificial Intelligence come together to discuss these topics of market adoption and technology requirements. This is an INTERACTIVE session. We will start with short presentations then open up the Fireside chat. The audience is invited to submit their questions and participate in what will be a lively discussion. There are many developments going on in the industry for storing and managing information. This webinar will cover the major trends, explaining the development and status as well as the potential impact on data center environments. Technologies such as advanced flash and storage class memory and enabling software and systems for digital transformation will be covered. Randy will give the industry analyst view of the trends and provide background on the maturity and adoption. In a recent survey of enterprise hybrid cloud users, the Evaluator Group saw that nearly 60% of respondents indicated that lack of interoperability is a significant technology-related issue that they must overcome in order to move forward. In fact, lack of interoperability was chosen above public cloud security and network security as significant inhibitors. This webcast looks at enterprise hybrid cloud objectives and barriers with a focus on cloud interoperability within the storage domain and the SNIA’s Cloud Storage Initiative to promote interoperability and portability of data stored in the cloud. High-Performance Computing (HPC) paradigms were born from the need to apply sophisticated analytics to large volumes of data gathered. The rise of open source and increased affordable hardware offerings helped Big Data to become an alternative approach. As HPC and Big Data continue their own trajectories, they borrow ideas and learn from each other. How does artificial intelligence impact this and how can these technologies benefit one another in 2018 and beyond? The term “Software-Defined" sounds like marketing hype but this technology is behind much of current IT systems’ advanced features and functionality - really. And, it didn’t start with software-defined storage. In this webinar Evaluator Group Sr. Analyst, Eric Slack, explains where software-defined came from, how it’s shaping IT infrastructure and what you can expect from this technology. Internet of Things applications present a complex challenge to the supporting storage infrastructure: large volumes of streaming data that often need to be analyzed in real time. IoT storage requires performance at scale and at a cost that won’t put projects out of reach. Join this webinar with John Webster, Sr. Analyst and data storage technologies expert, for a look at these requirements in more detail and new ways to prioritize them with today's storage technologies. Every new or recycled idea that comes along is going to be the ‘only way things are done in the future' according to some. This narrow view has been offered in the area of storing and managing information since modern computing began. The reality is much more messy. Different approaches for handling information are used and in reality, the processing and management of information use mostly unrelated solutions. This BrightTalk session will look at evolving datacenters and how information is handled including the storage technologies employed. There will be different approaches that will be discussed as part of the presentation. While the public cloud has been extremely nimble for service delivery, private clouds also offer rapid deployment options with the added benefit of greater control. Many ways to get to the private cloud are now available to enterprise IT developers and administrators ranging from do-it-yourself to complete turnkey appliances located on and off premises. In this webinar we outline the deployment models currently available to users and highlight some of the offerings currently available. The term Software Defined Data Center (SDDC) is making the rounds in the IT world. But while most companies may never actually build an SDDC, it’s important that IT organizations understand what this concept means and what it says about the future of IT infrastructure. In this 30 minute webinar, Evaluator Group Sr. Analyst, Eric Slack will define the software-defined data center concept, give some examples of software-defined products and technologies and discuss what how companies of all sizes can take advantage of this trend. 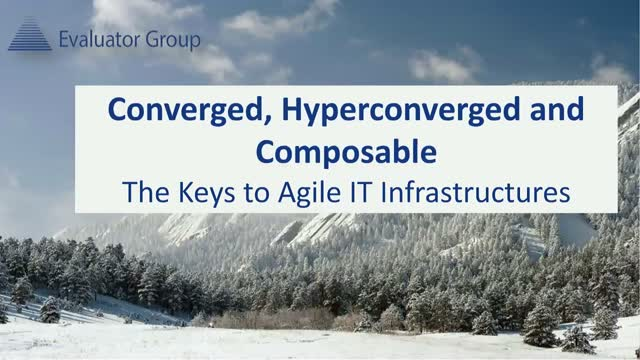 Hyperconverged infrastructures combine compute and storage components into a modular, scale-out platform that typically includes a hypervisor and some comprehensive management software. The technology is usually sold as self-contained appliance modules running on industry-standard server hardware with internal HDDs and SSDs. This capacity is abstracted and pooled into a shared resource for VMs running on each module or ‘node’ in the cluster. Hyperconverged infrastructures are sold as stand-alone appliances or as software that companies or integrators can use to build their own compute environments for private or hybrid clouds, special project infrastructures or departmental/remote office IT systems. Hyperconverged Infrastructures (HCIs) are popular solutions for a wide range of computing applications in small and medium-sized businesses. Their ease of deployment and operation, plus the ability to consolidate less efficient infrastructures into a comprehensive solution from a single vendor, have made them a good fit in these organizations. However, in the enterprise, companies with over 1000 employees, HCI adoption has been more limited. Certain use cases, such as providing a turnkey infrastructure for an enterprise’s remote and branch offices, are becoming more common. But what other usage scenarios are these larger companies looking at for hyperconverged appliances? The movement away from electro-mechanical devices for primary storage to solid state technology continues. Flash technology has been immensely successful and continues to advance with greater density and less cost. It is also driving changes in the interfaces and protocols for storage from disk-based to memory-based. Additional solid state technology is entering the market and will create a hierarchy of different performance and cost storage. This presentation will discuss some of these changes and their potential impacts. The cloud concept originated with the dot.com phenomenon in the early 2000s, but was brought to reality by the large web-based and social media companies in the last half dozen years. However, the requirements companies like Google and Amazon had for their clouds were beyond what traditional IT infrastructures could deliver - so they designed their own. These hyper-scale companies used software-defined, scale-out architectures and commodity hardware to build flexible, yet cost effective cloud infrastructures. Enterprises are moving towards a cloud-based model to deliver IT services. They see the potential of the hyper-scalers’ approach to creating cloud infrastructures but don’t have the resources or expertise to make that do-it-yourself model work. The Open Storage Platform (OSP) provides these companies with a solution that leverages commercial, off-the-shelf components and a “roll your own” approach to building private clouds. This webinar will focus on how the enterprise perceives and is using cloud computing based on a distillation of survey data. Topics discussed will include private cloud usage and what defines a private cloud in the eyes of the enterprise IT administrator, the growing use of multiple public clouds and how enterprise IT is involved, as well as an exploration of security in the cloud. This session dives into common use cases for all-flash and hybrid storage systems for virtualized environments in mid and large enterprises. Russ will focus on actual deployments, allowing listeners an opportunity to learn how to build a solid business case for solid-state, based upon findings from enterprise firms, as well as hands on performance testing with multiple systems in head to head comparisons, providing practical information.  Understanding of when and where to deploy solid-state storage or hybrid to maximize your IT budget and ROI. Web-based companies figured out a way to make high-capacity storage infrastructures using low-cost, commodity hardware. While this concept makes sense for large ‘hyper-scale’ companies, it’s not easily implemented by traditional IT organizations. The Open Storage Platform (OSP) is a model that the industry is using to define the hyper-scalers’ approach and provide a roadmap for building highly scalable, economical storage environments. Evaluator Group Inc., an IT storage analyst firm, has been covering Information Management, Storage and Systems for over 15 years. Executives and IT Managers use us daily to make informed decisions to architect and purchase systems supporting their digital data. We surpass the current technology landscape by defining requirements and providing an in-depth knowledge of the products as well as the intricacies that dictate long-term successful strategies. Our services include the Evaluator Series Research Library, lab validations, technical insights, and strategic advising.